Maggie has always put her family’s needs in front of her own, until one day—without forethought—she drives away, leaving behind her indifferent husband and two sulking teenagers. As she begins a quest of self-exploration, she meets new people, enjoys new adventures, and rediscovers long-neglected passions. For the first time in years, Maggie contemplates what she wants from life and soon realizes that her deteriorating marriage can no longer continue as it is. Can she and Andrew repair their broken relationship, or is their marriage over? Left to his own devices, Andrew is forced to take over the household responsibilities and bridge the growing divide between himself and his children. Slowly, he begins to understand what drove Maggie away—and how he can’t bear to live without her. But is it too late? Will Andrew lose Maggie forever? Maggie’s Turn was a quick read that got me out of a pretty ridiculous reading slump. But I’m not exactly certain if I read quickly because it was a good read, or if I was just so unable to put aside my disbelief of certain aspects that I wanted to see if the author would be able to write her way out of them. Some of the issues I had with the book were more about my own feelings of motherhood than anything. It was similar to when I first read Henrik Ibsen’s classic play A Doll’s House: I had a really hard time relating to a mother who could walk away from her own children. Does it happen? Absolutely. Could I understand why this particular character was fed up? Definitely. Could I sympathize with actually doing it? No, not really. There were some weird things thrown in, too, and I wasn’t really sure why: for example, the obsession with names relating to “Bob” seemed like it should be leading somewhere, but if it ever got there, I didn’t arrive with it. All that being said, I don’t think it was a bad book at all. Although I sort of knew where it was going, I still had just enough doubt to want to know how it would end. 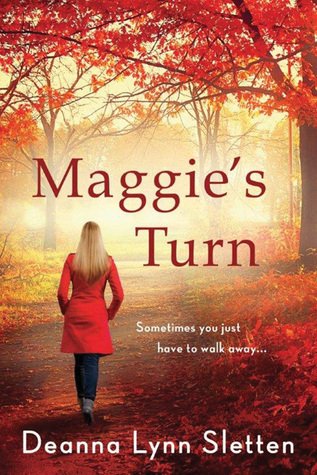 And whether or not I agreed with Maggie’s “decision” to leave, the journey itself was still interesting. But in the end, like Maggie’s life at the beginning of the book, this story just somehow felt like it was missing something.